This is the second in a series of books. If you haven’t read my review for The Maze Runner, check out that post first. 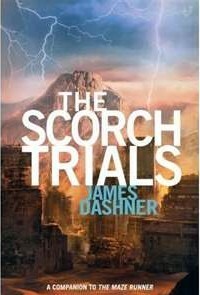 The Scorch Trials continues the bizarre series of events that have baffled Thomas since he had his memory erased before entering The Maze. Just when we thought Thomas and his friends are safe, he and his friends are tested against the second set of Variables, and we still don’t understand why. Yes, the world in in turmoil. Yes, a deadly, incurable disease is infecting humanity. Yes, the climate on a worldwide scale has been tipped on its head. But what does all this have to do with WICKED, the organization run by scientists and backed by multiple governments? And how can trials that result in the deaths of kids really help? What’s the point? I still haven’t figured out those answers at the end of book two. I didn’t like this book nearly as well as I liked the first one. It takes us out of the Maze and into the real world. The setting is bleak and barren, scorched, and we’re introduced to Cranks, those hopeless individuals who have contracted the Flare disease and been banished to cities in the wilderness where it’s survival of the fittest. It’s a dismal place–one I didn’t really enjoy. Yet, Dashner never lets up on the suspense. I have SO MANY unanswered questions, I have to read book three just to find out what all these weird trials are about. Suspense is good, but it was driving me crazy in this book. We only know as much as Thomas, who has no memory beyond the events in these two books, and that’s not much. Information is dealt out so slowly I almost put the book down. Almost. But I’d traveled so far with Thomas, I couldn’t. I had to stick it out, even through the book’s slow middle middle section. There were a few odd, insufficiently-explained events that bugged me, too. For example, two diseased people come walking up to the boys in the desert, have a brief conversation, and run away in the direction of the city. A city that it takes the healthy boys days to walk to in the scorching heat. Then there’s the odd fellow laying in the desert during a storm who can’t say anything except, “Bad people, stay away.” Another time, the boys are dying of thirst, get to civilization and feast. And never drink. This book felt much more vague and not as well put-together as the last. Also, while the language is still mild, this time around there is more death and violence. It’s not horribly graphic, and it’s pretty essential to the plot, but this is not a book for younger readers. Despite these downfalls, I’m off to find book three. ’m waiting for Thomas to get his memory back and explain some things to me!